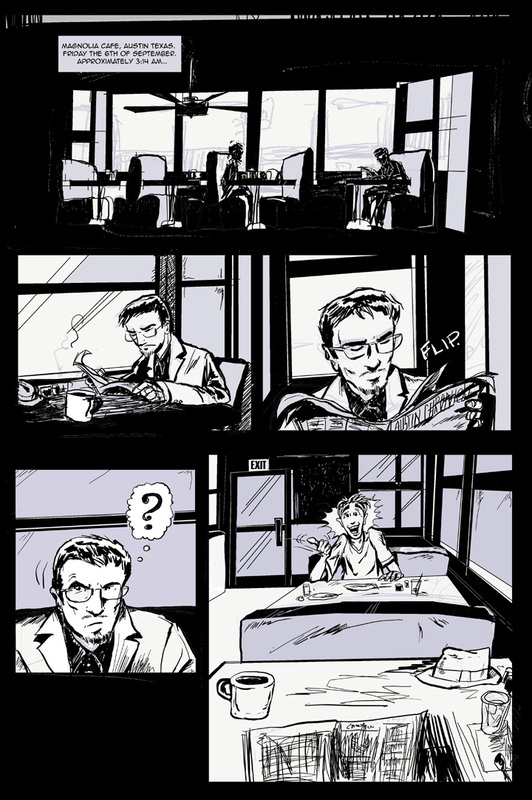 This is the first page of an 8-pager that I’m using as a test of some comic-making techniques before I launch into a real effort. Things unique to this: the "pencils” were in ballpoint, just scribbled into my sketchbook. I scanned those, and then decided I could do whatever I wanted with them once they were digital. So I rearranged the layout on the digital page, stretched panels to make them different sizes and proportions, overlaid two different panel sketches to make them into one hybrid panel, and so on. The long horizontal panel at the top of the page was originally a tiny thumbnail about an inch and a half wide that I just made to jot down what the room looked like (I was sitting in the same cafe at a different booth when the idea occurred to me). It’s based on an incident that really happened to me last week. I was going to write it up as a livejournal post, but then I started imagining telling it in comics form. It’s going to take about a week to do it, hopefully at a page a day (that’s another part of this experiment). It would have taken 20 minutes and only a few hundred words to tell the same story in prose. Drawing is very slow compared to writing. The story takes on a different mood when told with pictures, though. The sense of space and of events unfolding in time is something that would be absent from the prose version, which would just be about describing who said what and maybe what gestures they made. Anyway, it’s worth seeing it through now that I’ve started. Page generated in 0.202 seconds. Powered by Xcomic . Design by JRW Digital Media.